Christopher Bell knows a thing or two about the "slide job," having cut his racing teeth in open-wheel cars on dirt tracks across the country. 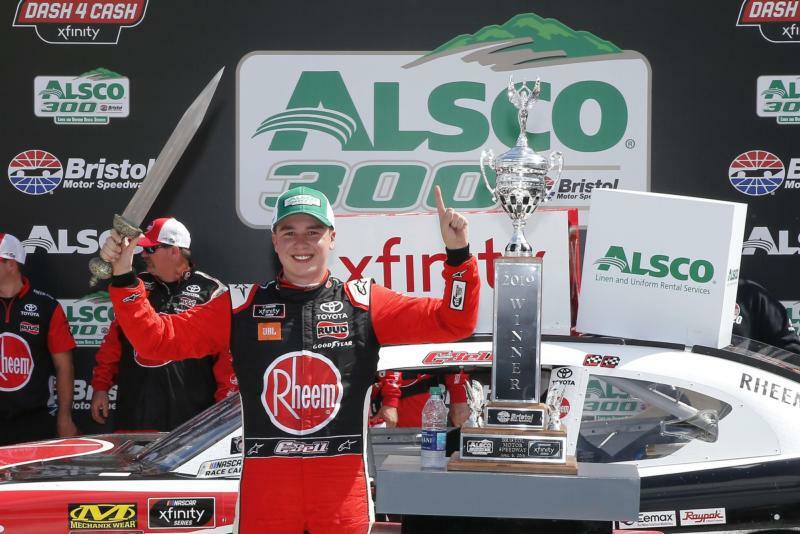 Bell used two of them to help secure the victory in the Alsco 300 NASCAR Xfinity Series race Saturday at Bristol Motor Speedway. The win was Bell's 10th in the Xfinity Series and his first at The Last Great Colosseum. It also secured him an extra $100,000 from the Dash 4 Cash program. "When I was in trucks, I struggled here," Bell said. "I never had a truck race where I was competitive. That aside, I've had three Xfinity races now. The first race last year I was really, really competitive before crashing, and the second race I ran second. "I'm not really surprised it took me that long to win, but it's definitely a race track I enjoy. It's probably P1 on my favorite list." Tyler Reddick finished second in Stage 1 and Stage 2, and was the runner-up to Bell. Polesitter Cole Custer was third, with Chase Briscoe fourth and John Hunter Nemechek fifth. Austin Cindric was sixth, followed by Justin Haley, Michael Annett, Noah Gragson and Harrison Burton. Bell's first slide job was on leader Justin Allgaier with 75 laps to go. Bell drove his No. 20 Joe Gibbs Racing Toyota deep into Turn 3, got under Allgaier and slid up in front of him. Bell drove a touch too hard and slipped close to the wall as Allgaier dove back underneath him off Turn 4. But Bell had the preferred outside line and hung on to the lead. Plus, Allgaier was having mechanical issues and dropped off the track. "The longer we ran, my car just kept getting better and better and better," Bell said. "That was kind of the motto of our weekend. We never really fired off super fast, but over the long run, we were really, really good." The second slide job came with 18 laps remaining. Brandon Jones had gambled by staying on the track under caution, taking the lead with older tires with 32 laps remaining. Bell's car was not a good short-run car and took several laps to mount a challenge on Jones. "I was a little bit nervous when had that yellow with 30 to go because I didn't know if that was going to be enough time," Bell said. "But it worked out perfect with my teammate staying out. I was able to get clear behind him. He did a great job on older tires, but for him to win the race with that old of tires was going to be pretty difficult." On lap 282, Bell made his move, slipping under and up in front of Jones to take the lead for good. "He just couldn't quite hold on on those older tires," Bell said. "As my air pressures built up, I was able to run him back down. He just wasn't good enough to hold me off. I knew I was going to have to do the slide job and then hopefully take the top away, which I was able to do." Allgaier took advantage of a communication mistake by Reddick and his spotter to win Stage 1. Reddick mistakenly though the stage ended a lap earlier and got out of the throttle on lap 84, instead of lap 85, and Allgaier was able to sail by and get the win. "It's a shame we thought Stage 1 ended too soon," Reddick said. "We should've gotten that point." Reddick passed polesitter Custer on lap 26 and stayed out front for 59 laps before the error.